Make that now three in a row for the Crested Butte Titans hockey team as they took down Battle Mountain 5-2 on Saturday, January 26. On paper the game looked to be a fairly easy contest for the Titans, that is if you go by comparative scoring. But coach Billy Watson knew better and he made sure his team was ready for the game. But there was nothing that could prepare them for the opening two minutes as a penalty immediately following the drop of the puck left the Titans in a penalty kill situation to begin the game. Their penalty kill has seen a lot of action this season though and was spot on once again and when the two teams returned to five-on-five hockey, they proceeded to trade off attacks on each net making for some high octane hockey. So much so that Watson adjusted his lines to create match ups throughout the game that played to Crested Butte’s advantage. “I saw it right away and the line of Coburn, Graham and Ted did a great job against them and that opened up chances for the other lines,” says Watson. A series of draws in the Battle Mountain zone set up the Titans for three shots on net in a row as Dom Piccaro won each face off and dropped it to the point for a shot. 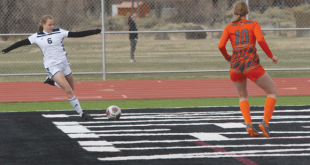 Battle Mountain’s goalie made the necessary saves to hold off the press and the teams remained notched in a scoreless draw. The Titans got a break 11 minutes into the first period as a Battle Mountain penalty gave the Titans a power play and they took advantage of it as an organized zone entry and patience with the puck set up Joseph Stock for the goal and a 1-0 lead. The Titans struck again a little over a minute later as Piccaro carried the puck up the wing drawing a defenseman and found Sam Stepanek open in the slot with a pass and Stepanek scored. “I thought we came out pretty hard and Joseph got us on the board which was great to see,” says Watson. Crested Butte continued to match Battle Mountain’s pace throughout the first period and their position play made all of the difference until the final 30 seconds. 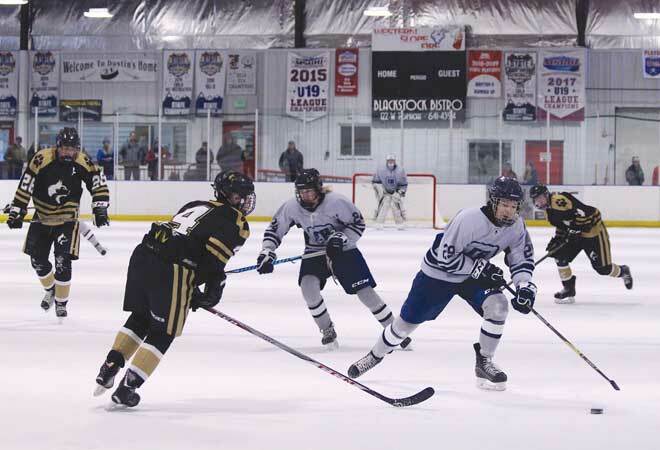 A draw in Battle Mountain’s zone offered up one last chance for the Titans but it backfired as Battle Mountain won the face off and sprinted up the ice for a 2-on-1 and scored to close the first period. The two teams picked up where they left off in the second period for more high-speed play until the sixth minute when the Titans struck again. This time the diligent pressure of the Titans in the corner created an opportunity when Piccaro dug the puck out and found Stepanek once again for the goal and a 3-1 lead. But Battle Mountain came right back scoring on a powerplay to hold the Titans in check and keep the pressure up. Crested Butte responded to the pressure though and rather than succumb to penalties and a breakdown in systems, they remained focused and were rewarded with a fourth goal as another quality zone entry and pressure in the slot forced Battle Mountain to collapse and the puck squirted out to Jack Lambert at the point. Lambert took one look, saw the upper corner wide open and buried a wrist shot through traffic and over the shoulder of the Battle Mountain goalie. The Titans killed off one last penalty to end the second period and came out in the third looking to finish Battle Mountain off for good. But Battle Mountain proved diligent in their efforts and had it not been for the work of Shaughn Rourke in net, Battle Mountain could have easily tied the game. But Rourke made the saves, the Titans regrouped and held on only to have Ted Trujillo tack on an empty net goal in the final minute for the 5-2 Titans win. Rourke finished the game with 32 saves. 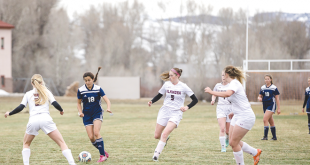 The Titans remain at home in Gunnison on Saturday, February 2 when they host Standley Lake at 2 p.m.
“They’ve got a couple good players and if we can shut them down and stick to our systems, we should do alright,” says Watson.